Since its inception in April this year, YouTube TV has been loved and praised by millions of users. The most important thing that gives YouTube TV a dignified place, is the experience it provides without the hassle of cable and cords. Whether its live shows, TV shows, sports or news you can catch all on YouTube TV. What more? You can even record your favorite shows on limitless storage to catch up with them later. Despite all these qualities users still miss a dedicated YouTube Tv app. Well! the wait for the app will soon be over. In an official blog, YouTube has confirmed that soon they are going to release a dedicated app for YouTube Tv for Android TV devices including NVIDIA SHIELD and Tv’s with built-in Android, such as Sony and Xbox One devices (Xbox One, Xbox One S, and soon Xbox One X). The blog also states that in few weeks, this dedicated app will be available for the Smart TVs manufactured by LG, Samsung, Sony. Also, Apple TV owners needn’t be disappointed as the app is coming your way as well. YouTube TV which started its successful journey with Google Chromecast will roll out the services with all the major players like Apple TV. Although it is being assumed by many that Roku would be included in this list, what comes as a bit of a surprise is that Amazon seems to be the only major player left out! Though there is a lot of hype about this new app, however not much has been changed for mobile devices. When it comes to big screen then the most noticeable and eye-catching feature is that, you can control your YouTube Tv with Tv remote or game controller if using Xbox. Moreover, to enhance the viewing experience of TV, the background has been given a dark film look. An icing over the cake, YouTube will also introduce a Live guide with its app, so that the users can get a preview of the future shows and events. Another trendy feature which is likely to be introduced with the app is background playback experience, which means that when you scroll between live and library home tabs or access the player controls, then the background play continues. The playback continues from where you left off on any device when you get home. 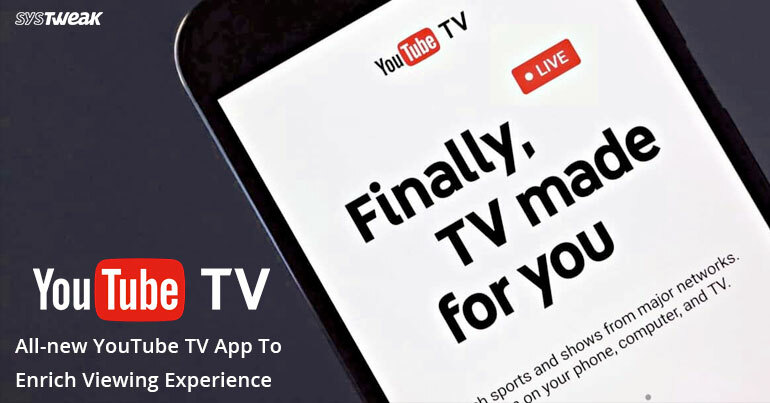 YouTube Tv which is still spanning its territories is all set to rock the stage with this all new app.